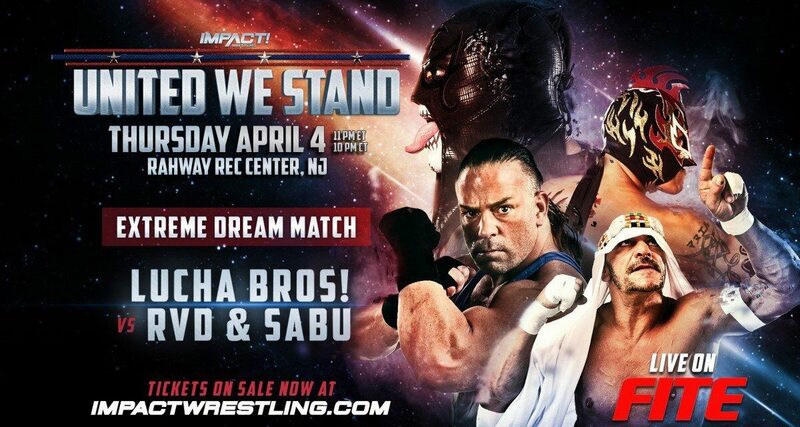 Impact Wrestling ran their 2019 Wrestlemania weekend show, United We Stand, this past Thursday (April 4) from the Rahway Rec Center, headlined by an extreme rules tag match between the Lucha Brothers and Rob Van Dam and Sabu. 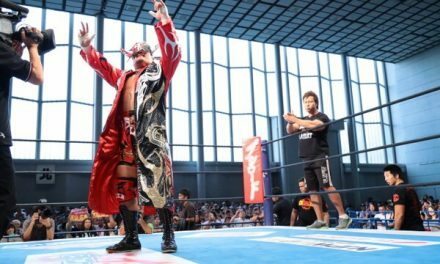 The show, broadcast on FITE TV, was dogged by audio issues like many this weekend, meaning that the commentary often cut out or the crowd seemed mute, conflicting with the sentiments of those there live. There was no Kotto Brazil or Jack Evans in this one, but recent Impact signee Ace Austin coming in as the sole replacement. For me, Austin was the star of a match that was perfectly fine but lacked any form of real story behind it that would have enabled it to reach the heights it perhaps could have done. You had some good flying from Pat Buck, Dante Fox and Jake Crist but Austin got the highlight reel moment with his dive from the top of the structure.
.@The_Ace_Austin took one of the biggest risks in the history of Ultimate X at United We Stand. This was a good opportunity to push the young man and they did just that as he got some good shine, landed some big moves and then took a beautiful cutter from Jake Crist off the ropes above the ring, which allowed current Impact World Champion Johnny Impact to scamper up and collect the X and future title shot. There’s a lot to unpack here, but this match ended up being quite a disappointment after looking good on paper. First of all, I don’t think Aerostar is particularly good. I don’t know why but he often seems very unsure of himself or where to go. Daga was the standout on the Lucha team, and looked crisp in his interactions with the Impact guys, which can only be a good thing with Callis and D’Amore reportedly interested in using him more going forward. Second, as much as I dislike Tommy Dreamer being the fourth man on the Impact team, it did mean we got to appreciate Moose (what a robe! ), Brian Cage and Eddie Edwards coming out separately, with all three having quite cool themes. As for Tommy, I like the guy and I think he’s a consummate pro who cares about the business but I mean come on—you’ve got space for him on the card but not for Josh Alexander or Willie Mack? The fact that I was right about the finish doesn’t really take away from the fact that this never really got into any sort of rhythm and ended up feeling quite sloppy and formulaic. 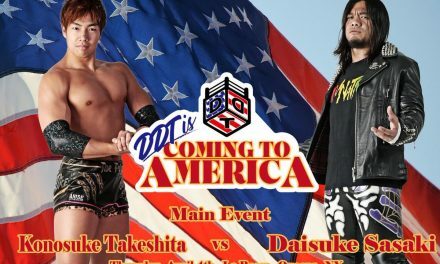 Losing Yamato from this match earlier in the week was a bit of a shame, but in many ways this was an upgrade and a match that I can actually be positive about. Although not on the level of the match these two had on Impact’s show in the UK last September, this was probably my match of the night.
.@PENTAELZEROM and @ReyFenixMx facing off with @TherealRVD and Sabu was a special moment. From a nostalgia and novelty perspective this was an amuse bouche, but Van Dam didn’t look good. He went for a spin kick early on and looked as though he could quite legitimately have taken Sabu out, whilst his attempt at a Rolling Thunder was just that, an attempt. Oh and that double dive? Yeah, Van Dam and Sabu almost took each other out. Don Callis going extreme ECW fanboy to sell Van Dam and Sabu’s offence was irritating but my bigger issue is that Sabu looked better than Van Dam and it’s the latter who’s returning to Impact TV at the end of the month. I realise that in this review I have come across as a curmudgeonly old miser. That’s probably an accurate indictment. For me, I feel that stance is somewhat justified when this show, which looked so good on paper, was dogged by lethargic wrestling throughout. I enjoyed Callihan/Havoc, Swann/Flamita and Ultimate X but the fact I only went *** or above three times on an eight-match card says it all really. A very pedestrian effort from Impact, which is a real shame at a time when they could do with as much buzz as possible.